Even with last night's win, the Yankees are slumping. No doubt about it. They can’t hit lately and are losing games they should be winning. But as you knew it would, the Yankee Universe is calm, assured that waiting this out is the sane course of action. Just kidding, the Yankee Universe is losing their mind. Not that there aren’t concerns. The Yankees’ batting average has been steadily dropping since July 25th and a number of Yankees are in harsh slumps. Nick Swisher has been batting .244 for the past 2 weeks; Mark Teixiera has been batting an abysmal .158 for the past 7 games. Robinson Cano hasn’t been doing much better in that time, batting .174. But the Grand Poohbah winner for awful batting is Francisco Cervelli, who has been batting .143—for the last month. And due to Jorge Posada’s age-induced gimpiness, Cervelli has had to play more, which from a pitching staff’s point of view, is fantastic, but from a hitting POV, is just a giant sucking hole in your lineup. So what do the slumping Bombers do? They can just ride this out and assume it’ll take care of itself. Which it might. The Yankees; however slump-drunk they are right now, are just too talented a lineup not to score runs. But who knows how long a slump might take and when they’ll snap out of it? 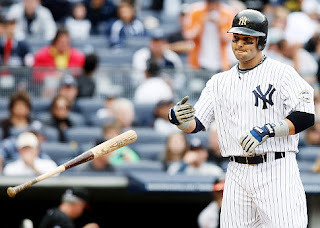 And if Swisher, Cano or A-Rod goes down on the injury list for a while, it may put a long-tern damper on the offense. They can try to get help from the outside. For instance, Manny Ramirez is expected to go on waivers shortly. That Manny could help is probable. But heck, we all know that getting Manny is a monster gamble. Can Manny (or whoever they would get) adjust to Yankee Stadium and Joe Girardi’s way of doing things. Lance Berkman hasn’t. And could the new guy (read: Manny) not drive everyone crazy in the process and stay off the back pages for the wrong reasons? Dubious at best. Or the Yankees could do what Bronx Baseball Daily wants and bring up help from the farm. Namely Uber-Prospect Jesus Montero. The 20-year-old (yup, he can’t buy a beer yet) doesn’t quite have the off-the-chart numbers of last year, and had a problem adjusting to AAA-ball early in the year. Of late however, Montero has been unconscious—batting .375 in the past 10 games, with a .700 slugging percentage and an OPS and 1.135. BBD isn't alone in wanting to call up Montero. The Pinstripe Blog wants it as well (although they are off on Gardner, who batting well lately and is tied for team lead in OBP), and PinstripeAlley.com feels Montero should be a September callup, but won't be. Well, I’m torn on this myself. 20 years old is really really young, and should Montero screw up mega-royally in a September playoff-important game, the damage done to his psyche could be huge. Take a look at Alex Gordon—the Royals rushed him because he played fantastically in AA, and as a result he’s a shell of the prospect he could have been. On the whole, I don’t think the Yankees should rush Montero. Which isn’t to say the Yankees batting woes aren’t a concern. A number of Yankees are in prolonged slumps, some other starters are dinged up and the Berkman, Pena, Cervelli bench hasn’t stepped up. All of this means the Yankees lineup is nowhere near what everyone assumed they would be. And lets not every speak of the Nick Johnson fiasco. Which leaves the Yankees...where exactly? Well, the Yankees could promote Ivan Nova to take over some innings for the innings-capped Phil Hughes and 14-mph-fastball throwing Javier Vasquez. They also could repeat the annual call-up of Juan Miranda, who is having a typical Miranda year of .292/.385/.511 down in AAA. Given a proper chance in the bigs, he could be a nice option for the Yankees. Or maybe they can call up Kevin Russo, Brandon Laird or Eduardo Nunez to try to improve the Yankees’ offensive depth. Will any of these guys be the spark the Yankees need to turn it around. Who knows? Or if the Yankees brought up top AAA players, Nova and Montero, would they be an immediate help to the Yankees. Same answer—who knows? At the end of the discussion, the Yankees probably shouldn’t rush Montero to save this season. They are still tied for first in the toughest division in baseball, despite all injuries and slumps. A slump in the Dog Days isn’t uncommon and not-quite-panic-button material for a team such as the Yankees. Do they need to right the ship? Of course. Should they panic and rush youngsters or pull a panic-filled move on the trade market. No. They'll get back on track. They pounded the ball again today. Cano, Tex and Swish all produced. Leave Montero where he is.